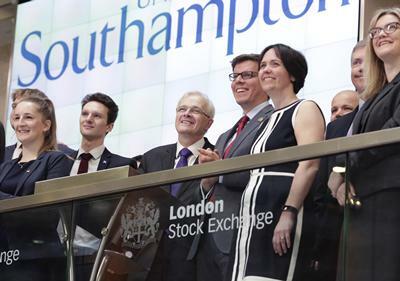 The University of Southampton has today opened the market at the London Stock Exchange to mark the university’s recent successful £300m public bond issue. Professor Sir Christopher Snowden, President and Vice-Chancellor of the University of Southampton, was joined by Lady Snowden and colleagues from the university and its professional advisors in celebration of the 40-year bond, issued on Wednesday, 12 April, representing the largest capital injection in the University’s 155-year history. The University’s student social enterprise society, Enactus Southampton, also took part following their success in regaining the Enactus UK national title and a berth in the Enactus World Cup later this year. The bond will mature in 2057 and is subject to a fixed interest rate of 2.25% - a record low interest rate for a public bond issued by a UK university. It will provide around half of a £600m total investment the university is planning over the next 10 years, the remainder coming from internally generated funds. A founding member of the Russell Group of universities, Southampton is a global centre for excellence in research, education and enterprise. The institution has gained prestigious global recognition for its successes and its history of world-changing achievements. Delivering against its strategy will enable it to secure consistent ranking in the top 10 universities in the UK, and in the top 100 internationally. With nearly 24,000 students, over 6000 staff, and an annual turnover in excess of £500 million, Southampton is acknowledged as one of the country's top institutions for medicine, engineering and oceanography. Ranked eighth in the UK for Research Intensity following the UK’s most recent Research Excellence Framework, Southampton is home to a number of world-leading research centres including the Institute of Sound and Vibration Research, the Optoelectronics Research Centre, the Institute for Life Sciences and the Southampton Marine and Maritime Institute. The University is a partner of the National Oceanography Centre at the Southampton waterfront campus and in the coming months will open the UK’s first dedicated Centre for Cancer Immunology and the new National Linear Infrastructure Laboratory.